Ok, ok, I know that is a cheesy title. 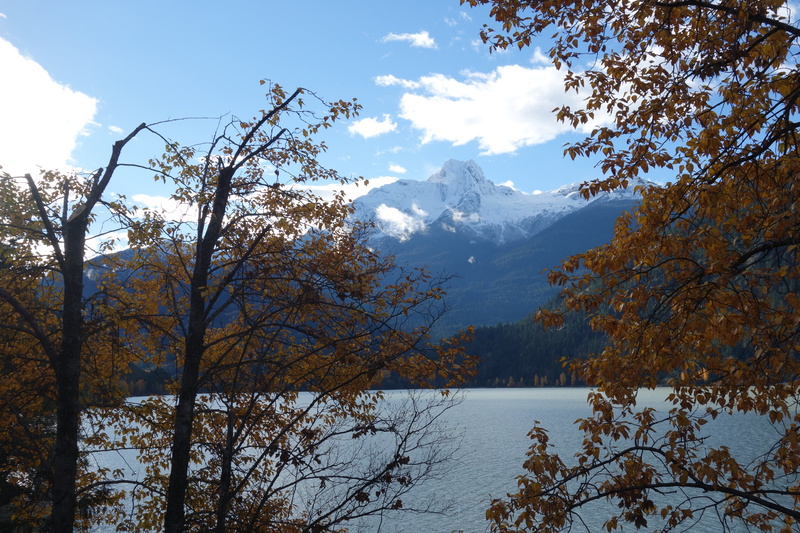 But seriously — the temperature has dropped below 0 degrees Celsius, the days are getting shorter and more importantly, there’s SNOW on the mountains! 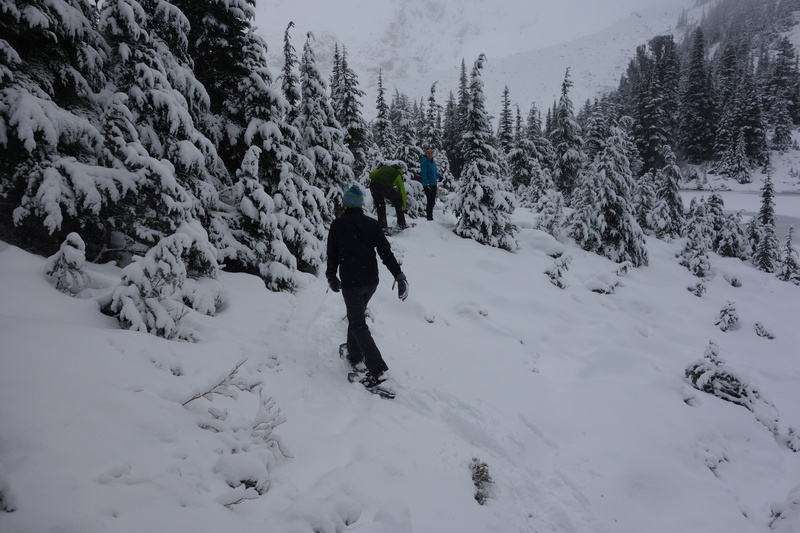 I spent last weekend hiking and exploring the beautiful, snowy mountains near Pemberton, BC, about an hour north of Whistler. 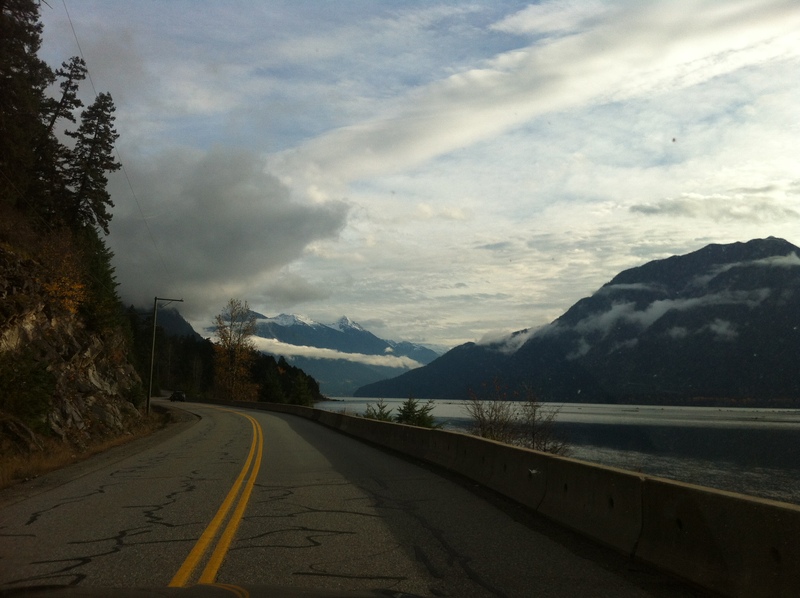 The town of Pemberton itself is quite cute, nestled in a valley between picturesque farms and some seriously jaw-dropping mountains. I’ve visited in summer before for the very fun Slow Food Cycle, but it was my first time in the area for a chilly visit. When we arrived, it was still definitely still fall. Near the road and even up the mountain tree-line, the evergreens were peppered with yellow-leaved deciduous trees and the sun was just breaking through a low-hanging fog. Our destination was about half an hour past town, at the Cerise Creek trail on Duffey Lake Road. 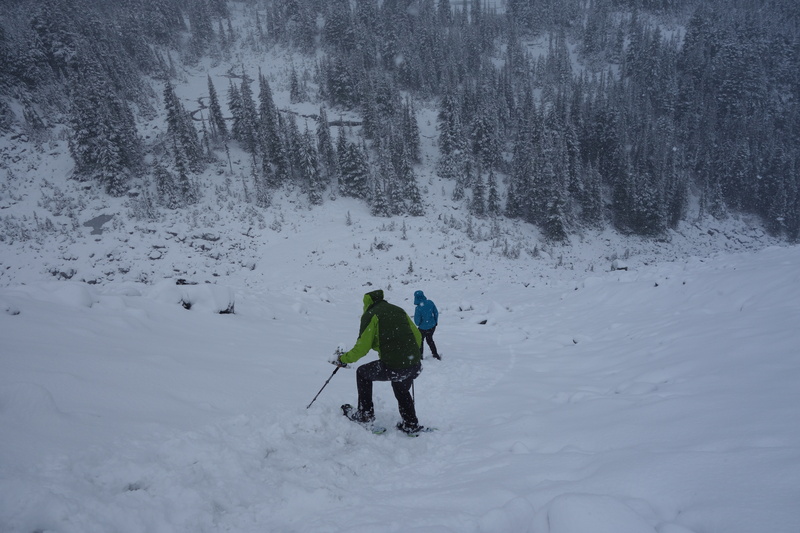 The plan was to hike (or snowshoe) up to Keith’s Hut — about 4km with a 450m elevation gain. There’s some good blogs and resources out there about the trail already (see here and here) so I won’t bore you with the details, but basically, we took the summer trail for a typically stunning hike through the Coast mountains, with parts leading us through thick, mossy trees and other sections opening up to wide access roads with spectacular views. Without snow on the trail, it took about 2 hours. We didn’t see any signs of winter until we reached the cabin itself — and what a sight! Snow had definitely arrived. The lake was covered in a thin layer of ice and soft flakes fell lightly on our faces. The cabin was already crowded with ski tourers, hikers, and generally people keen for the season to start. Although fairly squishy, we thankfully didn’t need to set up our tent outside in the snow! Considering how many people were there so early in the season, taking a tent or avoiding weekends is definitely recommended. After a cosy night inside, we awoke in the morning to a thick layer of fresh, powdery snow. The dump meant we could enjoy a fun wander in our snowshoes up to the nearby ridge before making our way back down to the car. The fresh snow changed conditions on the trail completely. The trail, which was already fairly steep in parts and involved a slightly sketchy traverse across rocks, was now covered in snow almost all the way back to the road. After slowly working our way down the trail, we warmed up at the kind of quirky Skookumchuck Hot Springs, where clothing is optional but relaxation is not. Stopping in at the local pub Mile One for dinner was the perfect way to end before making the long trip back to Vancouver. Snow, hot springs, cosy pubs, and picture-perfect days? Winter, I’m ready. Bring it on! Enjoy. It’s 41 degrees in Grafton today. 40 tomorrow. Bet you don’t miss that Margie.